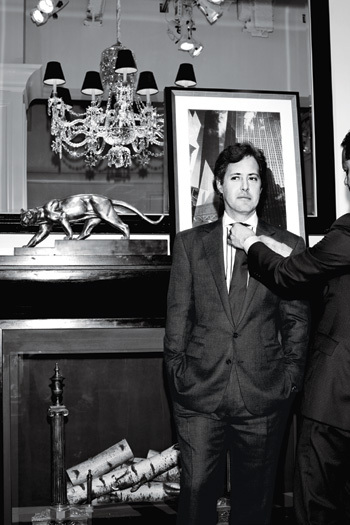 David Lauren is turning his father’s empire into a digital leader–and shaking up the fashion industry. David Lauren was racked with anxiety. It was 2 a.m. in London and a small crowd of Ralph Lauren employees huddled outside the company’s U.K. flagship on New Bond Street, trying desperately to make a technology come to life in an unprecedented way. David, the 39-year-old son of Ralph and the company’s executive vice president, was planning to debut a novel 4-D light show in less than 24 hours, to celebrate the launch of Ralph Lauren e-commerce in the U.K. The 4-D project had been months in the making, relying on architectural light-mapping techniques to create an eight-minute holographic video that would be projected onto the storefront. If everything went right, the building would seemingly disappear, replaced by 3-D images of 15-foot-tall models walking down runways and giant polo players galloping across fields. A rendering of Ralph himself would wave to the throng of fans. The exorbitant fourth dimension: the scent of Big Pony cologne, which would be spritzed onto the crowd below. Despite the challenges of that November evening–in addition to the technical complications, David had to get permits to close city streets and convince competing retailers, including Cartier, to let Ralph Lauren project the show from their windows–the 4-D project brought cheers from the thousands in attendance the next day. Hours later, a parallel 4-D spectacle wowed onlookers at Ralph Lauren’s New York flagship on Madison Avenue, to commemorate the 10th anniversary of ralphlauren.com in the U.S. The London show inspired two spectators to purchase $50,000 watches on the spot–transactions that hardly offset the cost of the project, estimated at $1.5 million (a figure the company declines to confirm). But the big value came from the 700 million media impressions that videos of the shows received online. “You could do a road show and never reach that many people,” says Marshal Cohen, chief industry analyst at the NPD Group. Ralph Lauren is one of the most iconic, successful fashion brands on the planet. With a market cap of $13 billion, it extends from the fashion runways to mass market, from Bergdorf Goodman to JCPenney, from customers seeking a $17,000 Ricky handbag to those interested in an $85 polo. The company encompasses more than 20 interrelated brands–including newcomers Denim & Supply and Collection Denim (launching this month)–and is engaged in an aggressive global expansion, having repurchased most of its licensed businesses over the past 10 years. Going directly for the heart of the fashion world, Ralph Lauren recently opened a new flagship on the Boulevard Saint-Germain in Paris, and this fall, it will launch e-commerce in France. Revenue is climbing steadily, and the company’s share price has more than doubled in the past two years. It’s never easy to be your own man and your father’s son, but David is absolutely both,” says Anna Wintour. By associating Ralph Lauren with new digital technology, David has done more than imbue the brand with a current vibe. He has, in the process, made the company a progressive leader among fashion peers. In 2009, David produced an online-only fashion show for Ralph Lauren’s heritage Rugby brand that, for the first time ever, allowed viewers to shop the looks in real time. (The industry standard puts six months between the runway and when items land in stores.) Rugby’s sales rose 34%. Last year, David and his team introduced the RL Gang, an online illustrated children’s storybook featuring live-action video of kids in Ralph Lauren ensembles–which can be purchased as the story progresses; children’s sales jumped 300%. While analysts estimate that online revenue currently accounts for just 6% of the company’s overall sales, they project it could climb as high as 30% in the years ahead. “It’s one of the fastest-growing, best-executed businesses for Ralph Lauren,” says Omar Saad of ISI Group. 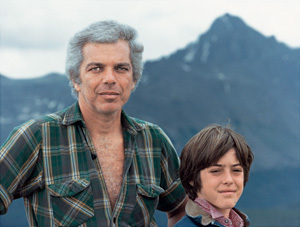 Ralph and David, pictured here in 1982, at the RRL Ranch in Ridgway, Colorado. The company’s headquarters are in a sleek glass skyscraper, yet when you emerge from the elevator on the sixth floor, you feel as if you’ve entered an extravagant hunting lodge. The aroma of leather and mahogany is transporting. The walls are wood-paneled, the chandeliers are brass, the couches overstuffed. You can hardly believe you’re in New York. But this isn’t where David works. He and his team spend their days across the street, in a different kind of space: simple, sparse, modern. David, dressed casually in red flannel, cargo pants, and sneakers on this particular day in May, has a streamlined office, boasting a glass desk, a black lacquer coffee table, and steel bookshelves peppered with sports paraphernalia and treasures such as a Back to the Future hover board signed by Michael J. Fox. (“I idolize him,” David confesses.) 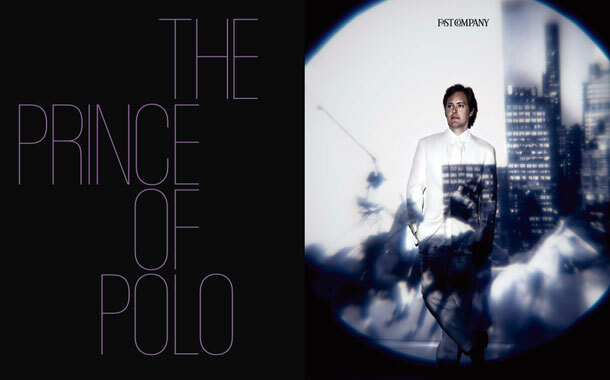 The one element that echoes the HQ: the Ralph Lauren imagery proudly displayed on the walls. “They both have strong egos and visions,” says Andrew, David’s older brother. A man famously involved in every decision made at his company, Ralph acknowledges an unfamiliarity with the digital world. “It was a project I wasn’t really knowledgeable about,” he says. And not everything David suggested was immediately embraced. “I didn’t get it,” Ralph says of the 4-D show, recalling when David first pitched it to him. “I had to take a step back and say, ‘I’m not sure of this.’ On my own I might not have done it.” He was persuaded, he says, by David’s passion and insistence. Ralph Lauren Media’s 4-D show featured architectural light-mapping and generated 700 million media impressions. “I was very much against joining this company,” David says today. “It was difficult to say, ‘I want to work for my dad.&apos;” David’s interest wasn’t fashion. As a sophomore at Duke University in 1990, David launched a magazine for twentysomethings called Swing, which strove for a youthful take on current affairs. It was David’s defense of his so-called apathetic generation. Publisher Hachette Filipacchi acquired Swing after David graduated, building the circulation to 200,000, but in 1998, after four years, the monthly magazine shuttered. Disheartened, David spent the following year traveling and pondering his future. That was in 2000. David’s initial goal was to build an e-commerce website that featured original entertainment content–a well-trod marketing maneuver today but eye-openingly ambitious a decade ago, particularly for a fashion house. Ralph Lauren Media (the division started as a joint venture with NBC Universal, but the company gained full ownership in 2007 after buying out NBC’s 50% stake for $175 million) pulled together 40 employees (mostly from inside the company) and began cranking. That year, Ralph Lauren launched the luxury industry’s first e-commerce site, created Ralph Lauren Magazine, an online publication with original articles, and Ralph Lauren TV, an original web channel covering fashion, design, and sports, and featuring celebrity interviews. Together, the pieces formed what David calls “merchantainment,” the blending of commerce and content. This strategy echoed Ralph’s own distinctive print-advertising moves from 30 years ago: The goal was not to push specific Ralph Lauren products, but rather to sell the idea of the Ralph Lauren lifestyle. After seeing the 2002 flick Minority Report, David was inspired by the film’s special effects, in which Tom Cruise’s character interacts with and manipulates holographic images. 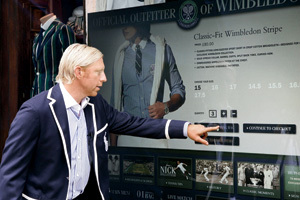 David saw the futuristic scene as an opportunity: What if the windows of their retail stores could feature interactive images, and passersby could view Ralph Lauren merchandise and make purchases? David placed a call to the office of director Steven Spielberg to ask how the technology could be replicated; it was science fiction, he was told, not reality. Undeterred, David launched his team on a long-term R&D project, and in 2006, Ralph Lauren introduced the first interactive, shoppable windows in their New York stores. The pioneering technology was fawned over by the media, and, in an unlikely turnabout, garnered a “How’d you do that?” call from Spielberg himself. “Our intention was never to launch a website. Our intention was to build a media brand,” says David Lauren. When Ralph talks about David’s childhood, the business mogul disappears; he is simply a father speaking fondly about his son. “When David was little, he zoomed around the house on his little bikes in his little robe and slippers. I’d look at him and think, This guy is going somewhere,” Ralph recalls. “He’s a very sweet boy–man,” he corrects himself. 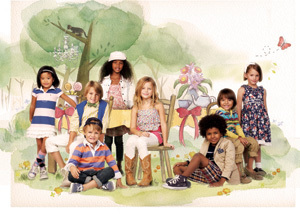 A shoppable, online children’s storybook, the RL Gang, has led to a 300% increase in sales of kids’ clothes. The weight of the family business, David says, was never placed on the shoulders of the Lauren children. “My parents always told us, ‘Just be happy,&apos;” he says. Andrew was a film buff growing up; he now runs his own production company and has produced such critical hits as 2005’s The Squid and the Whale. Younger sister Dylan, 37, used to create art out of candy as a child; she now owns Dylan’s Candy Bar, an empire in its own right. David’s passion for media, by contrast, led him to the family business. “He found a place that felt comfortable, but it also gave him a certain amount of freedom from my dad,” says Andrew. David was glowing as his father walked down the runway of New York’s Skylight Studio in February, accepting applause for the 53 China-inspired pieces of his fall 2011 collection. Ralph, dressed in all black, looked proud of the gowns that lifted the crowd–a veritable who’s who of the fashion industry–to their feet. As he stopped to embrace his family members, it was hard to miss the genuine admiration David feels for his father. “Of course David looks up to his dad,” says Gallagher.